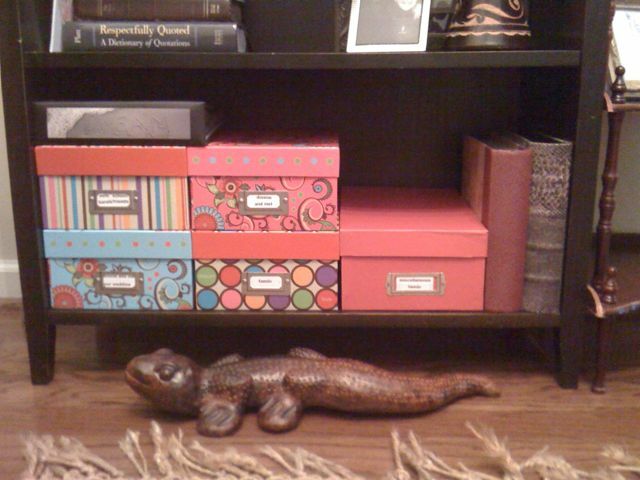 Mel's World » Organizing Pictures, Finally! Ok, we all know we love to take and have pictures to look back and remember but oh my goodness, what in the world are you supposed to do with all of those things???? I know I have thousands and I am just getting started with having a family. I can’t imagine 20 years from now how many there will be. Since we are cleaning our house out from top to bottom, this was just another thing that had to be done. I decided when I was pregnant with Bree that I would get all of our pictures organized before she got here so I could just add her pictures as they came. Good idea huh? I got as far as buying all of the albums, pretty pages to put the pictures on, the highest quality covers to go over each beautiful page and so on. Well, I got as far as organizing the pictures into proper categories and um that’s it! 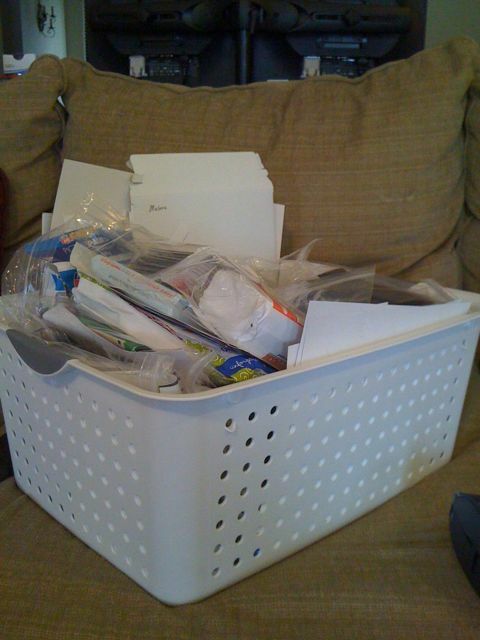 She arrived and there sat the big basket of categorized pictures in ziploc bags. So now we have no place to hide the unsightly basket full of pictures and something had to be done. My mother in law once told me that after the first baby, you just won’t do things that you would have done before and boy was she right about that! Who has the time? If I had the time, I wouldn’t want to use it to make perfect picture albums when I could be spending that time playing with Bree or doing something nice for myself. So I decided to forget about all of the nice things I spent hours shopping for at Hobby Lobby, waiting each week to see if something else that I wanted would be 50% off. I will just let it all go and get it out of my way because its just never gonna happen and I don’t want to feel like a failure every time I look at the stuff. My solution: I went to Ross and bought 5 super cute photo boxes for a grand total of $10 and spent 2 hours while Bree was napping and its finally done!!!!! WooHoo!!!! So happy am I!!! The pictures are organized and accessible and I have no more worries about it. I am finding that there is usually an easier and less expensive way to get what you want without all the fuss. Take a look at these pictures and dare to criticize for my short cuts!!! OHHHH MYYYY GOONESSSS!!!!!! Could you even imagine if I got all of our pictures out of the building and started what you have done after 36 years of pictures.. I really need to do it but that task seams so OVER WHELMING!!!! Wish I could. Maybe I can do it some day soon. Love you!